Brisbane went into Sunday's showdown chasing 24 points to lock in a week one home final against the Dragons. For stages it looked as if that opportunity might escape them, but two tries in the final 10 minutes to Jamayne Isaako and Joe Ofahengaue handed them the result that they desperately desired. Isaako was the first to cross in the 70th minute before Ofahengaue extended the lead in the 74th. But the real star of the match was the off-contract Oates. The towering winger equalled the record for most tries scored in one game at Brisbane, crossing four times to boost his side's all-important for-and-against and hand them the crucial home final next Sunday against the Dragons. Brisbane has not won a final away from Suncorp Stadium since 2009, when they defeated the Titans on the Gold Coast. While hoodoos can always be broken, the Broncos will no doubt breathe a sigh of relief knowing the knockout final will be played on their home turf. This gives them the best advantage to push their premiership claims. And, in a tantalising twist, Brisbane will also face off with former halfback, Ben Hunt. The two sides have only met once since Hunt joined St George Illawarra on a multimillion-dollar deal at the start of the season and it was the Dragons who came away with the two points when they defeated Brisbane 34-12 in Round 1. But both teams have come a long way since that opening match of the season and it is the Broncos who are running hot into the finals series with all the momentum. 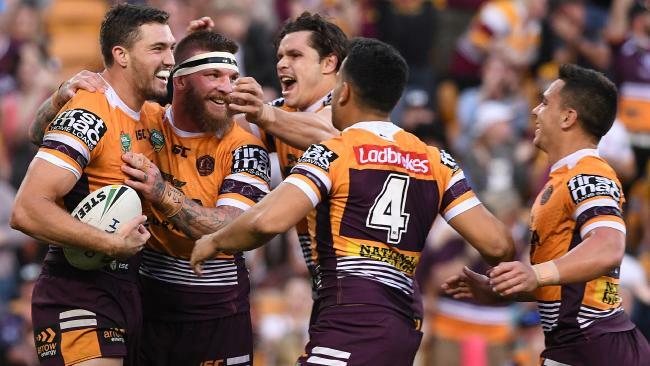 Brisbane will go into the clash as the favourites after emerging as serious premiership contenders over the last three weeks. Oates' four tries saw him join the likes of Steve Renouf, Wendell Sailor, Karmichael Hunt, Justin Hodges, Denan Kemp and Israel Folau in holding the record for most tries in one game. He came close to nabbing a fifth but was denied after the referees ruled Korbin Sims was not square at marker when Manly turned over the ball. While Oates was the standout, the Dragons will also have to be wary of the lethal halves combination of Anthony Milford and Kodi Nikorima, which goes from strength to strength each week. The forwards were also dominant through the middle, with Joe Ofahengaue, Matt Lodge and David Fifita all impressive.